Document Rendering for Signers – SIGNING EXPERIENCE. New methods have been deployed to make documents appear faster and more consistent to the signer. 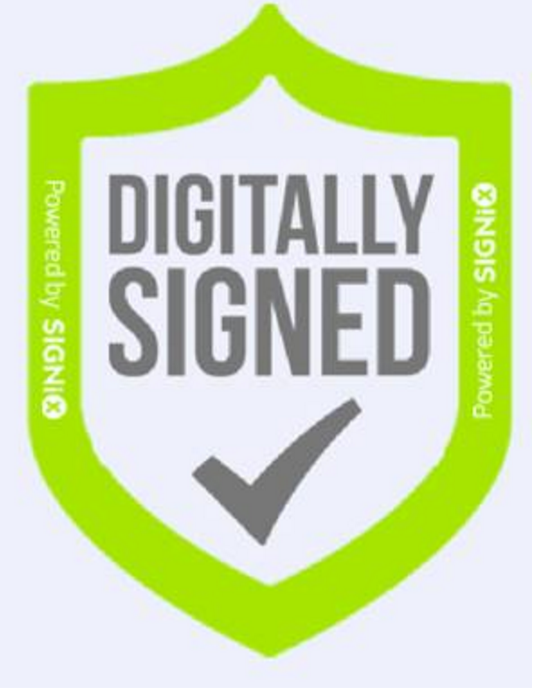 New Digitally Signed logo – SIGNING EXPERIENCE. A shiny new logo will appear next to signatures that takes up less horizontal space, leaving more room for the signature. Email Bounce Notifications. SIGNiX is now happy to offer email bounce notifications to submitters when emails are sent to an address that does not exist or is experiencing an error. Going forward, if an email address is wrong, the submitter will receive an email to that effect and the transaction will be paused so the submitter can contact the signer and fix the email address. NOTE – This feature will be live soon, but still requires some testing before we enable it. IP Address in Audit Trail. SIGNiX has always been recording IP address for signers and reviewers, but is now making that piece of process evidence more easily visible in the audit trail. NOTE – This feature will be live soon, but still requires some testing before we enable it. Miscellaneous fixes and updates for optional signatures. Minor client-specific customizations, optimizations and bug fixes. Infrastructure changes relating to document archiving and storage.